For Longines, the lengthy process of mastering the measurement of time goes beyond its quest for precision with exacting aesthetics in its watchmaking process over 185 years of know-how, elegance and performance. From the very beginning in Saint-Imier, Switzerland back in 1832, Longines has kept up with the consistency of numbering its watches; every Longines timepiece has its own unique serial number, initially recorded in the workshop books until 1969, then on microfiches during the 1970s and 1980s, before the advent of the digital age. While this complete traceability simplifies the authentication of Longines pieces, it also makes it possible to accurately track the development of production: all watches can therefore be identified down the decades, and have their own individual identity – all stored in the Longines Electronic Archives (LEA), a one-of-a-kind database that brings together all the existing archives concerning each serial number. Therefore, when the manufacturer exceeded 50 million watches produced last year, the winged hourglass brand can quickly and accurately inform clients and brand enthusiasts on each of the 50 million timepieces produced to date. Not to mention, honouring and perpetuating the brand’s continual preservation of its legacy with a unique piece with the serial number 50,000,000 for the occasion. The timepiece, issued from The Longines Master Collection, is intended to be iconic of the brand’s rich heritage, and a preview of a new model available soon. Combining classic elegance and excellence, this model houses the new and exclusive L897 automatic calibre within a 40mm diameter rose gold case, offering a 64-hour power reserve and an annual calendar displayed at 3 o’clock. The hours, minutes and seconds move with the blue steel hands that stand out against a silvered dial stamped with a barleycorn motif. 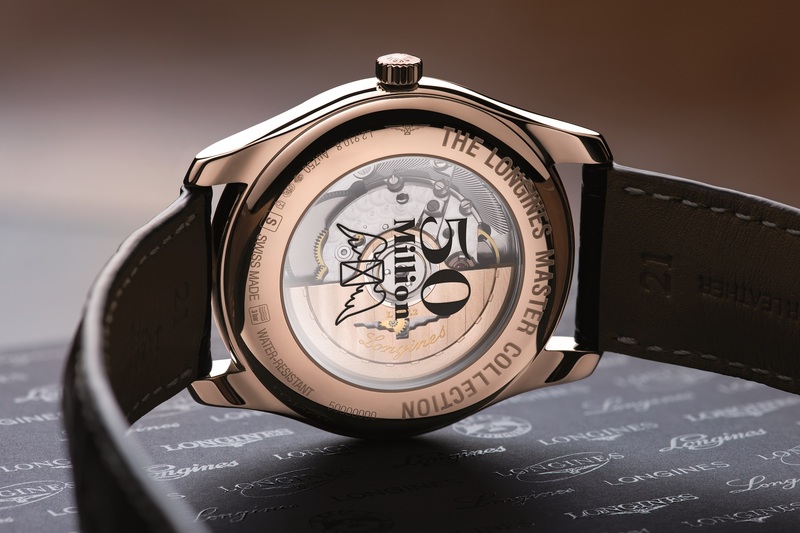 A commemorative inscription adorns the timepiece’s transparent case back, which reveals the intricate workings of the movement. The worthy heir to the brand’s know-how, amassed through combined research into exacting technology and timeless elegance, and above all, a true testament to its longevity and legitimacy, The Longines Master Collection 50,000,000th timepiece will find its place in the brand’s considerable Historical Collection in the Longines Museum within the company’s walls in Saint-Imier, Switzerland, where the long-established watch brand emerged and flourished to the horology legend it is today.